Leopard Slugs (Limax maximus) are common garden residents which many of us have seen before. This is a bit surprising since they are not native to North America but rather are originally from Europe. Thanks to their ability to live with humans and to travel with agricultural products, they have been accidentally introduced into many parts of the world. They go by a wide variety of common names such as Great Grey Slugs, Great Garden Slugs, and Tiger Slugs. Though quite variable in color, they normally have spots and can attain large sizes (up to 8 inches, though 3-4 inches is more common). Their scientific name literally translates to "biggest keeled slug." Though quite big, there are bigger slugs, even in the keeled slug family (called this due to their slightly roof-shaped last third of their backs). Among our local species though, none get to their size. Leopard Slugs have a most unusual mating system. First of all, they are all hermaphrodites. Each slug has both male and female sexual organs, though they cannot mate with themselves. Rather they suspend themselves by a mucus rope they form, pair up, and mate while hanging in the air. These acrobatic sexual antics lead to some interesting looking eggs. The first time I found some, I had no idea what they were, looking like little glass BB's or beads. I raised them in a tank to discover what creature made them and was rewarded less than a month later by tiny slugs. One day old slugs next to their eggs and a dime for size comparison. It takes Leopard Slugs about two years to sexually mature and they can live a little over three years total. They have a strong homing instinct, usually returning to the same place to hide every night. They are primarily nocturnal and are quite the omnivores. They can feed on a variety of things, both living and dead. They can eat detritus, pet food, and even pet poop. They can feed on carcasses, fungi, and unfortunately garden plants. Leopard slugs are also cannibalistic, sometimes chasing down other slugs to eat. Since they are larger and faster than our native slugs, I suspect that is why we usually only find these and not many other types. Now before you go reaching for that salt shaker or setting out that stale-beer slug trap to drown them, lets recall that these beasts have been with us for a long time. First recorded in North America by George Washington Tryon in 1867, they've been spreading at a snail's pace (they are after all snails with out complete shells, though they retain a small shell under the shield-part of their bodies) and are here to stay. So, sure you might try to control some if they become pests, but there will always be more, following their slimy trails back and forth faithfully through your gardens and lawns. Among our strangest of shrubs is the Devil's Walking-stick (Aralia spinosa). There are a lot of peculiar traits to this common tree. It also known by a variety of different names, though most are also used used for other trees, in particular Zanthoxylem calva-herculis, leading to confusion. These include Hercules Club, Prickly Ash, Angelica Tree, Prickly Elder, Toothache Tree, Spikenard, Tearblanket, Pigeonberry, and Pigeon Tree. Its most common name comes from the straight, very prickly trunk, which usually only has a single, branchless stem and rarely gets over 30' tall at best. They normally form small clumps of trees, with individual plants sending up new shoots around the parent plant. Damage to the roots and stems seems to encourage even more prolific suckering of new stems. This may be an adaptation helping the sun-loving tree react to forest fires and fallen trees to take advantage of the sun spots. The fruit/flower stalk on this shrub is very colorful even after the berries have fallen off. The stems and trunks almost never have any branching and most of the growth is concentrated near the top of the plant, giving it a very unique appearance. It stands out in almost every season, whether because of its huge flower heads (up to 4' wide), brightly colored fruit stalks, prickly aspects (even the leaves have spines along many of the veins, thus the scientific epithet of spinosa), or huge berry clusters. Berries (several already missing) and fruit stem. The berries do not last long, though they are not a preferred food choice for any particular creature that I'm aware of. Each berry contains 3-5 very small seeds in the middle of the juicy fruit. They can really stain clothes or your fingers. Individual plants generally do not produce flowers or fruits until after their 3rd or 4th year of growth. Some believe the fruits were a favorite of the now extinct Passenger Pigeon (and thus its other common names of Pigeonberry or Pigeon Tree), but that is debatable. Most parts of the tree, even leaves, have prickles and spines. Devil's Walking-stick has the largest leaves of any tree in North America. They are so large as to appear to be branches, but in reality are giant, twice compound leaves. Some can be over 3' long and 2' wide. That they are actually leaves is evident when they fall off in the Autumn, leaving a very prickly single trunk to stand alone. A single twice compound leaf, the largest of any of our trees. The large leaves serve as food for 8 different species of caterpillars and are heavily eaten at times by various beetles. Their prickly nature discourages browse by such creatures as deer. The finely chopped leaflets have been used when very young as potherbs, but others warn of their mildly toxic nature, especially if older or not well cooked. Some people even develop dermatitis from contact with any part of the plant at all. Giant leaves in their Fall color, though yellow is more common. Devil's Walking-stick has had a variety of uses by people. Ethnobotanist Daniel Moerman recorded that the Cherokee used various parts to treat rheumatism, sores, venereal disease, ease the pain of decaying teeth, and even for flatulence. They used the sap from the roots to try and ease paralysis, though they also noted that the green roots were poisonous.The Choctaw made a poultice from the boiled roots as a cure for boils and swollen leg veins. The Koasati used drops derived from it for sore eyes, while the Rappahannock thought it could be used for boils, fevers, and sores. During the Civil War, Confederate doctor Francis Porcher was tasked with finding alternative medicines for those no longer available due to Union blockades. He noted that the bark could be used for chronic rheumatism, colic, syphilis, and the pain from dental cavities (thus another moniker of Toothache Tree). As a vomiting agent, he stated that it was "probably to be preferred to any emetic yet discovered among our native plants." In South Carolina, he said the plant was "the rattlesnake master par excellance" for treating snake bites. He was quite a supporter of its medicinal uses. As can be seen, there is a lot to this shrub besides its unusual appearance. Something to keep in mind when running into this prickly character anytime in the year, but particularly this Halloween season. Acorn Weevil grub next to a dime for size comparison. The dark particles are frass and a you can see a couple of holes in the acorn itself. Acorn Weevils (Genus Curculio) are a type of beetle that feeds inside nuts such as oak acorns. Like all weevils, they have extremely long snouts as adults which they use to pierce and feed. The female adult Acorn Weevil drills a hole in a forming acorn and lays her eggs inside. The little grub is plump and light colored, feeding inside the nut until the Fall. The acorn is eaten away from the inside and often you can find the tell-tale hole. They will feed on almost any oak species. In the Fall, the acorn falls and the grub somehow manages to squeeze out the small hole. Squirrels do not eat the damaged acorns and they will not germinate. When collecting nuts for planting, a good test to see if you have viable acorns is to give them a "float test." You drop the acorns in the water and observe them. Those that sink are okay and weevil free. The ones that float or sink very slowly releasing air bubbles are occupied. They float due their light nature and air in the eaten nut. The larvae (grub) buries itself in the ground to pupate after emerging. It may take up to 5 years for it to emerge as an adult weevil and start the process all over. I had heard the weevil grubs were edible and so decided to find out first hand if that was so. I have eaten beetle grubs before, notably the large Suri beetles grubs in the jungles of Peru, but these were small and a first for me. They were actually a bit rubbery and not as creamy as the Suri grubs. You would need a lot to fill you up, but I guess would be a good source of protein. I've been told they taste better if quick fried in butter, maybe so. They were not particularly appetizing to me. A common but under appreciated multi-stemmed shrub, Common Elderberry (Sambucus canadensis) usually ranges from 4-12' in height. It tends to grow along woodland edges, particularly where it is moist. 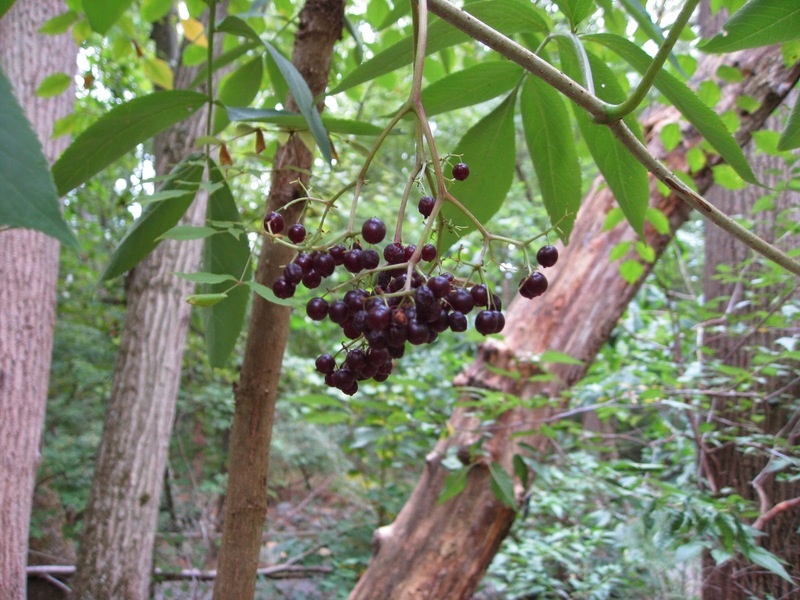 Another local species, Red Elderberry (Sambucus racemosa), is more of a mountain species, but can be found along the Potomac River. Throughout the ages, members of the Sambucus Genus have been used for a variety of different reasons where ever they grow, and North America is no different. Numerous Native American Indian tribes made use of Elderberry according to ethnobotanist Daniel Moerman. The Chippewa, among others, foraged for the fruits. The Algonquian used the bark as a laxative and other parts to induce vomiting. The Houma, Delaware, Oklahoma, Rappahanocks, and Cherokee made a poultice from Elders to treat wounds. The Cherokee also used it to treat rheumatism, burns, boils, and fevers, as well as to make wine. The Iroquois (Haudenosaunee) used it to treat headaches, cuts, stomach ailments, fevers, venereal disease, mumps, and liver troubles. The Dakota, Omaha, and Ponca all made a beverage from the blossoms and fruits. It seems that wherever it grew, the native people made use of it. During the Civil War, Confederate Dr. Francis Porcher was tasked with finding alternatives to goods and medicines that were no longer available due to war blockades and report on them in a book he was ordered to write. He found a wealth of uses for Elderberry, not only those by the indigenous tribes, but from the European Elderberries. He recorded its use as a laxative, to treat syphilis, rheumatism, and for wine. He wrote: "a decoction made by pouring boiling water over leaves, flowers, or berries is recommended as a wash for wounds to prevent injury from flies." Some people still use the crushed leaves to repel flies. Modern day forager extraordinaire Samuel Thayer describes numerous ways to eat Elderberry in his books. He does however note that some people get nauseous from consuming the fruits, especially raw, but believes it due to an intolerance in some people to the actual seeds. He includes preparation techniques for Elderberry wine, jellies, fritters, pies, Elder Blow tea from the flowers, and as a flour additive. He also notes that many believe that Elderberry juice can shorten the duration of flu and viral infections, something worth exploring (and used in a Walking Dead episode). The fruit clusters can be fairly large, at least before the birds get to them. The stems hollow out easily. The pith easily comes out. This has led to their use as musical pipe instruments, pan pipes, spiles for tapping maple sap, blow guns for Southern indigenous tribes, as well as pop guns and pea shooters by kids. Some of these had to be made with caution however since the leaves and stems are poisonous. If not dried well, sticking the stems in mouths can, and has, resulted in poisonings. Several cavity nesting bees, such as mason and little carpenter bees, often use the hollow stems to raise their young. Woodpeckers and other birds sometimes figure this out and drill them out. Other animals also make use of this plant as well. It serves as a host plant for 42 caterpillar species who feed on it, while 120 bird species have been documented feeding on the fruits. Deer are not fond of the leaves however, perhaps making it more valuable as a deer resistant planting, as if its blooms, carefree nature, and wildlife value were not enough. All in all, this shrub has a lot going for it, and for the many creatures that depend on it.